The US Navy is one step closer to developing a futuristic supersonic weapon capable of firing missiles between 80 and 160 km at seven times the speed of sound. The 40 feet-long "electromagnetic railgun" consists of parallel rails and uses a magnetic field and electric current, instead of chemicals, to generate the energy required to fire the rounds. The first weapon-scale prototype of the railgun began undergoing firing tests last week and the next big step toward putting the superweapon on US warships by 2020, LiveScience reported. "The Navy envisions using railguns to destroy enemy ships, defend against enemy missiles, or bombard land targets in support of Marines hitting the beaches," it said. Newly-released video shows the prototype railgun using an electric-powered launcher rather than gunpowder to fire a huge hypersonic bullet in a cloud of flame and smoke. 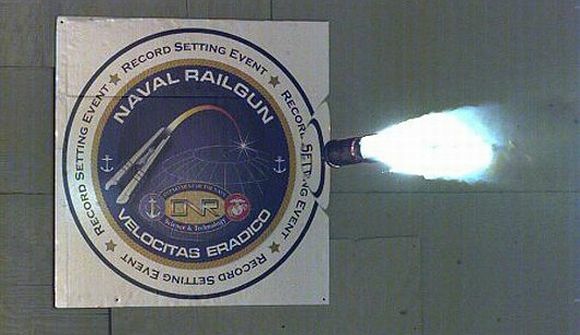 The Naval Research Office hopes that its new test phase, scheduled to last until 2017, leads to a Navy weapon capable of hurling 40-pound projectiles at speeds of 7,240 to 9,010 km per hour over 80 to 161 km. 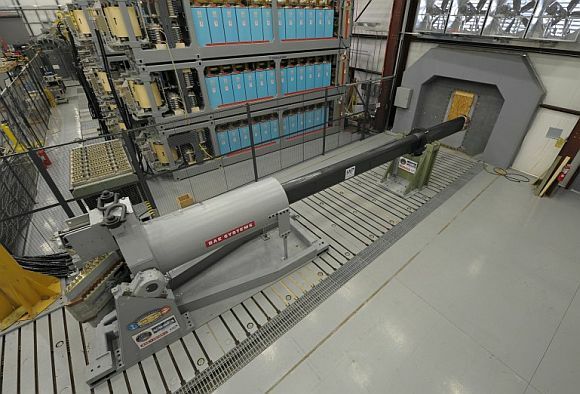 The full-size prototype, made by BAE Systems, "looks like a real gun," said Roger Ellis, program manager for the railgun at the Office of Naval Research. Previous tests involved clunky laboratory prototypes that would never see action aboard a Navy warship. Navy commanders ultimately want a weapon capable of firing up to 10 guided projectiles per minute at targets up to 100 miles away. Navy warships currently have five-inch guns capable of firing at distances of over 20 km. "There is potential to replace the 5-inch gun, but it would do far more," Ellis said, adding the railgun could hit the same distant targets that Navy missiles strike today. 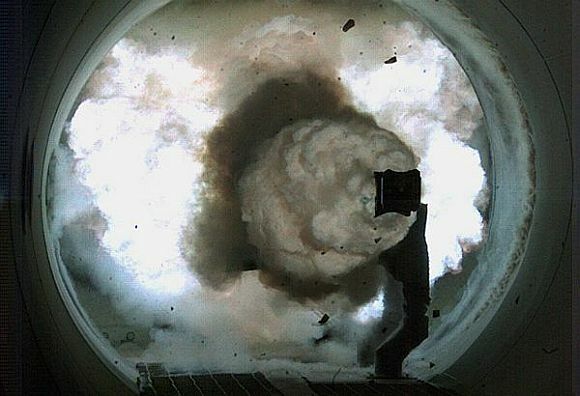 Tom Boucher, director at the Naval Surface Warfare Centre Dahlgren Division in Virginia which is developing the railgun, said the flames that seen in the video of the test firing come from a combination of electricity arcing across the launcher, shavings of aluminium reacting with the air, and the bullet's hypersonic flight. 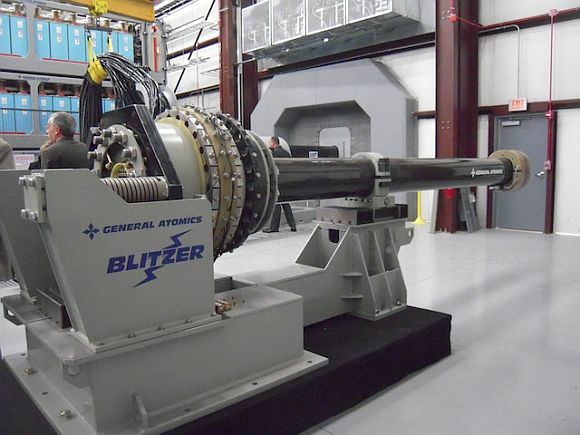 A second railgun prototype, built by General Atomics, is set to arrive for testing in April, Ellis said. General Atomics, one of two private sector companies providing a prototype, has invested $20 million in the project. "We believe this is definitely a game changing capability that'll enable our forward presence and freedom of the seas," said Tom Hurn, director of rail gun programmes for General Atomics. According to the experts, because of its hypersonic speed produced by the railgun, a projectile shaped like a bullet could deliver devastating damage even without exploding. It could include electronic guidance systems such as GPS that would be protected against the immense heat of the giant bullet's hypersonic passage. "The rounds we are firing currently are non-aerodynamic slugs," Ellis said. "They match the interior ballistics of what the launcher is expected to see but are intended to slow down quickly."